Taste: A perfect everyday coffee, full of flavour. With a delicious aroma, this coffee will form a nice crema after every brew. Our House Blend is full bodied, with distinctive floral and nutty tones. Varietals: Bourbon, Catuai and Pacamara. Processing: Fully washed and sun dried. Batch Number: 1343124: 9/10/18 and 11/10/18 Note: This was our trial batch.  At Roast Shop Coffee we are on a mission to get the UK drinking better coffee with a fair price tag. We make incredible, freshly roasted coffee accessible to everyone. Coffee beans are sourced ethically from reliable, sustainable supplies around the world – South America, Africa, Asia and beyond. Roasted in small batches at Roast Batch HQ in Newcastle, your coffee will be shipped within 2 days, making us faster than our competitors! Our coffee isn’t ground until the last possible moment before being sent straight to you to enjoy. You can request extra bags via web and phone or skip, delay or change your delivery frequency at any time. She makes sure every roast tastes amazing. Roast Shop Coffee is about giving people freshly roasted coffee. Fresh coffee tastes a lot better than coffee that’s been sat on a shelf for months in a supermarket. Currently, in the UK either in supermarkets or with big coffee chains their coffees are over roasted (dark roast) to standardise taste, this kills the aromas and origin character of the coffee. We want to provide real tasting coffee. Great coffee is not made by baristas using standard beans, roasted industrially in coffee shops. We are here to transform the UK's coffee culture. Every year we donate a chunk of our profits. This action stems from one of our core values, which is to operate and use coffee for a good cause. Here at Roast Batch we believe in fair and transparent pricing of freshly roasted speciality coffee. We want to be open and honest with the job we do here as a coffee roaster and supplier. We are artisan coffee roasters with years of experience. We have supplied independent coffee shops with freshly roasted premium coffee, so we thought, why not offer it to the public! Our intention is to bring top quality coffee right to your door wherever you are in the UK. Today we are sourcing world class beans from independent farms. We link the right farms to our suppliers and ensure that the farmers are getting paid the highest rates. This is not our social responsibility, it's about integrity and a sustainable future for all. Now we are delivering to many coffee drinkers all around the UK. Are you ready to subscribe to Roast Shop Coffee yet?